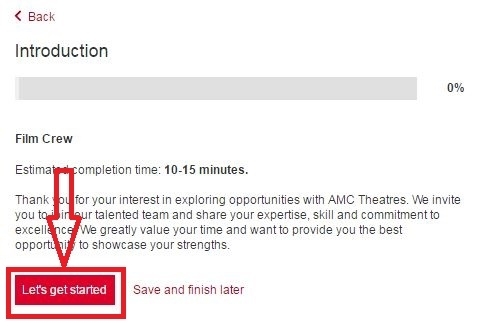 Go to AMC Theatres careers page at amctheatres.com/careers to get access to the online application. The company provides job vacancies in three areas: Theatre Crew, Theatre Management and Corporate. You choose one among them and click to see job openings. Please sign in with a pair of valid email address and password if you have an AMC account on this site. You may log in using Facebook and Twitter as well. It is required that you should create a new account if you are a first-time user. After signing in, you may enter keywords or job title in the search box on the left side. Search results will be displayed on this page afterwards. Choose an ideal position and start to apply for it. Let's just take "Film Crew" in Southlands as an example. After opening the link to the position, you will see some details about it. Please read to make sure that the job is ideal for you in nature and location, and most importantly, that you are qualified to take it. 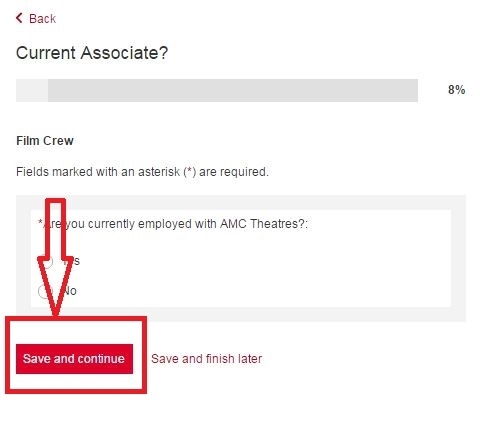 Then click "Apply to job" to continue. Here is a brief introduction to the job and the application process. It may take you 10 to 15 minutes to complete the whole thing. Job application is important, so you are advised to do this application when you are fresh in mind. Please click "Let's get started". From this step on, you will be asked some questions. Firstly, tell the company if you are a current employee by selecting "Yes" or "No". And click "Save and continue" to move on. You have now completed 8% of the whole progress, which can be seen on the top of this page. In this step, you are going to fill out some personal information which includes phone, address and email. 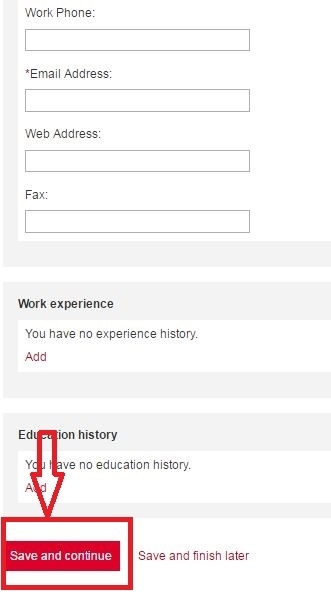 You may add work experience and education history if you have any. 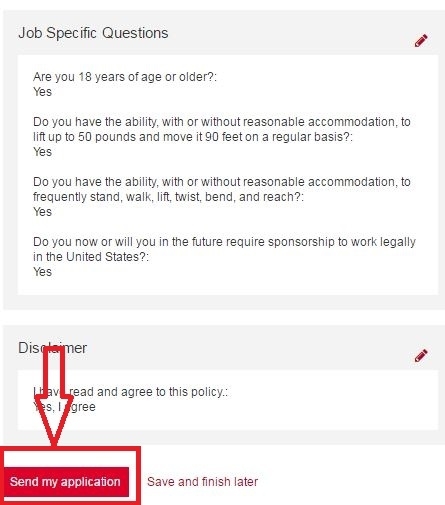 Next, you are going to upload resume, answer some questions about your availability, additional job information, source, gender and race, veterans information, disability self-id as well as job specific questions, and then you need to read and accept the disclaimer. Finally, please review all the information and questions that have been saved and send your application. 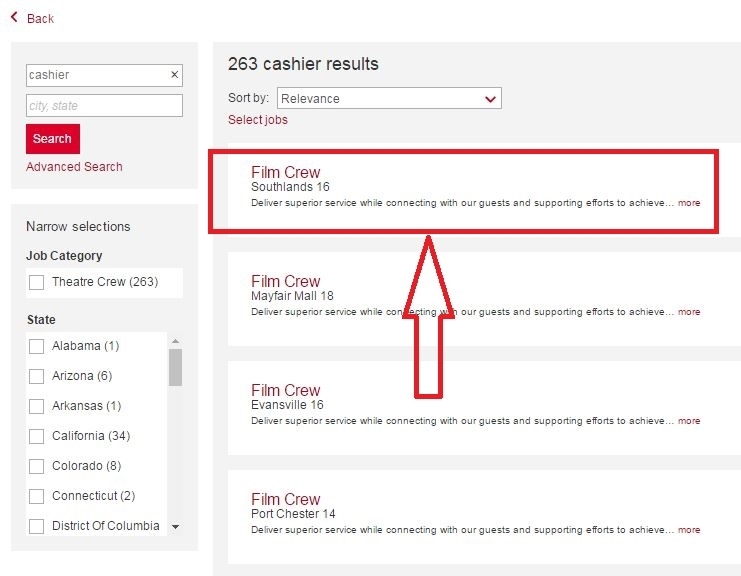 Click amctheatres.com/careers to apply for AMC Theatres jobs online.